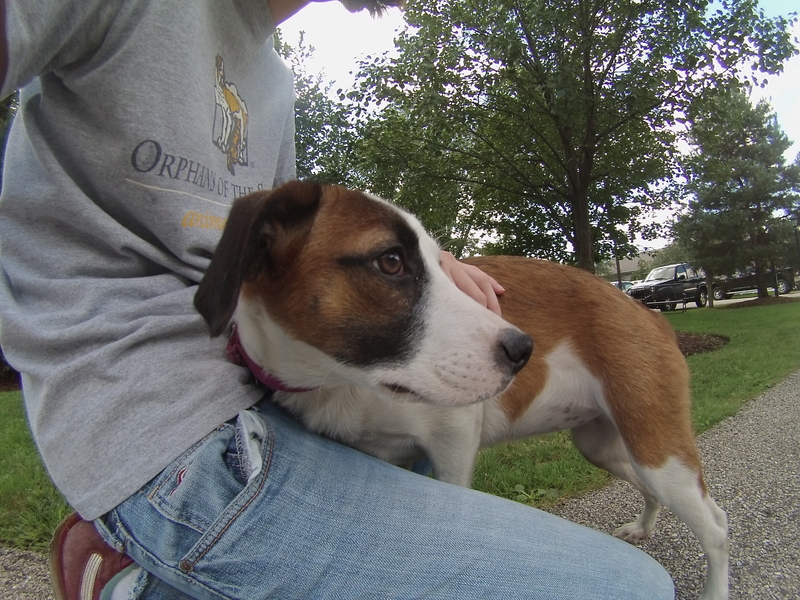 Pets always know how to brighten your day, and the dogs at Orphans of the Storm® are no exception! Some are more playful than others, but they all know that the best way to have a good time is to be with their new family. Buster the eight-year-old Hound mix is a big (and I do mean big) cuddle-bug. When we were in the off-leash run, Buster spent most of his time hanging out next to me so I could give him lots of attention, and in return he put his front paws in my lap and gave me doggy kisses. 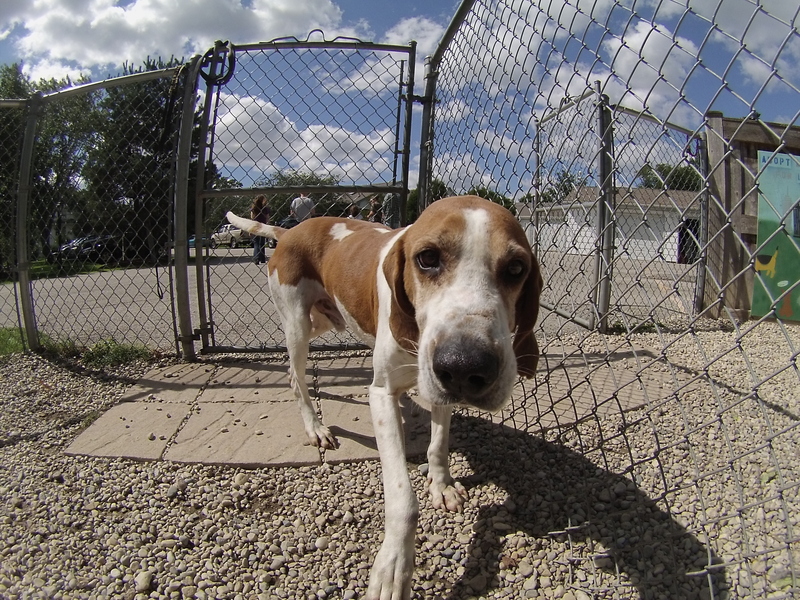 There’s just something about those soulful Hound faces that make them so lovable! Buster is sure to be a loyal companion. When another volunteer who has walked Buster multiple times came by the fence, Buster’s tail started wagging and he eagerly watched and waited for the volunteer to say hello to him. 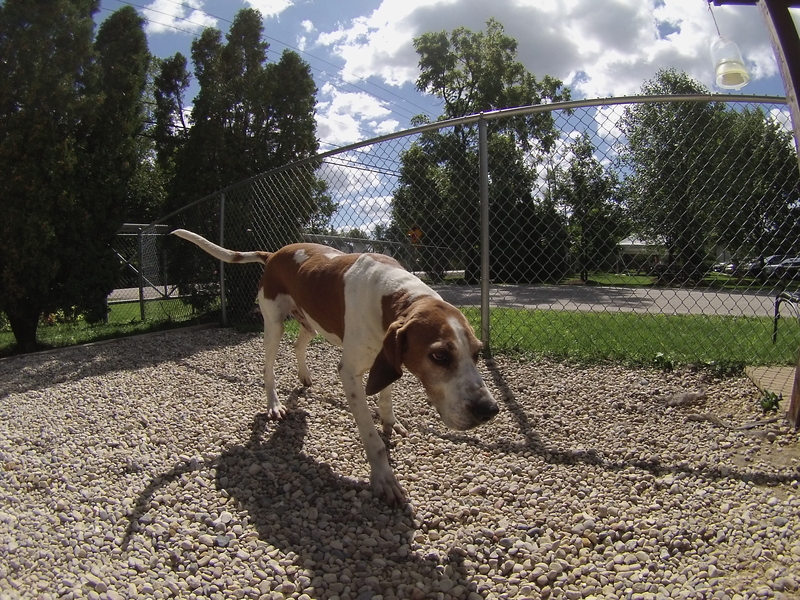 Buster gets along with people and dogs alike, and is currently sharing his kennel with Stella (see below). 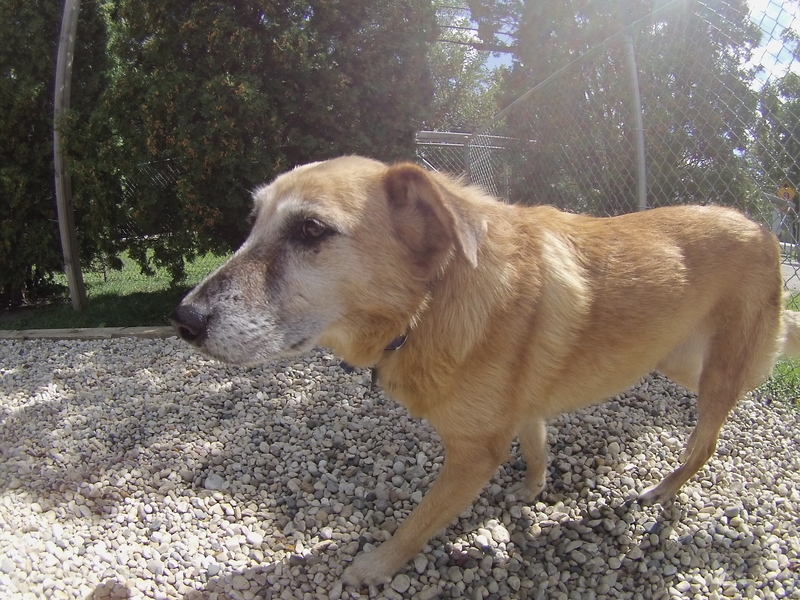 Buster is sweet, gentle, affectionate, and handsome! What more could you want in a new best friend? 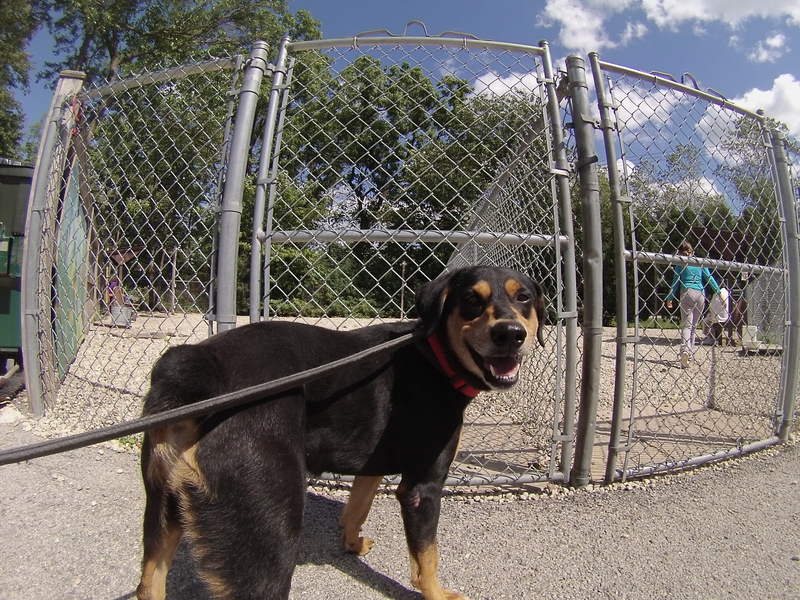 If you think Buster might be the pooch for you, come in soon to meet him! 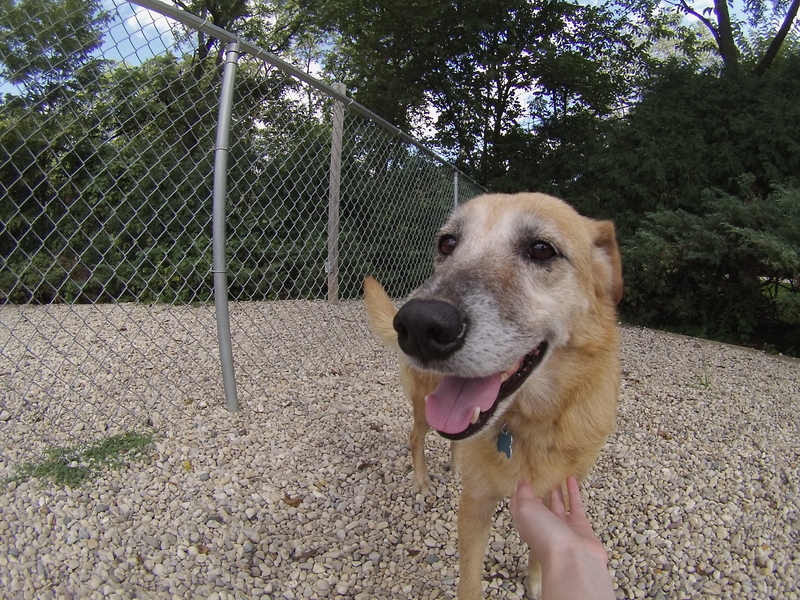 Stella the six-year-old Retriever mix is a sweetheart. She waited patiently to get her leash put on, and once we were out she was a very nice walking companion who didn’t do much pulling at all. Stella can be a little shy at first, but after a few minutes of getting to know you she warms up and happily accepts all of the attention you can give her. Stella enjoyed exploring the off-leash run and would probably like to be able to have a yard of her own, but since she walks so nicely on the leash it isn’t a necessity. Stella is currently sharing her kennel with Buster (see above), so she could go to a home with or without another dog. Since Stella is more middle-aged, she’s pretty calm and gentle. On your next visit to the shelter, be sure to say hello to Stella! London the eight-month-old Hound mix is the first “true” puppy (under a year old) that I’ve walked in a while, and I’ll admit I didn’t want to put her back in her kennel! London is what I would consider the epitome of a puppy: she is super snuggly, super friendly, and super silly. London was a bit overwhelmed by all of the other dogs barking at her when I first took her out of her kennel, so she had no problems with me scooping her up and carrying her out to a quieter area in the grass. When I set her down, she put her front paws on my legs as if she wanted to be picked up again. London hasn’t quite mastered leash-walking yet, so sometimes she liked to hold the leash in her mouth while we walked like it was a toy and sometimes she would wriggle around like she was trying to break free. But most of our time together was spent with London snuggling in my lap, which is a very enjoyable way to spend an afternoon! At one point I thought she was going to fall asleep because she was so comfy. Puppies usually don’t last at the shelter for very long, and one as cute and friendly as London is likely to get a lot of lookers. Come in soon if you think London is the pup for you! Who can say no to London’s sweet face? 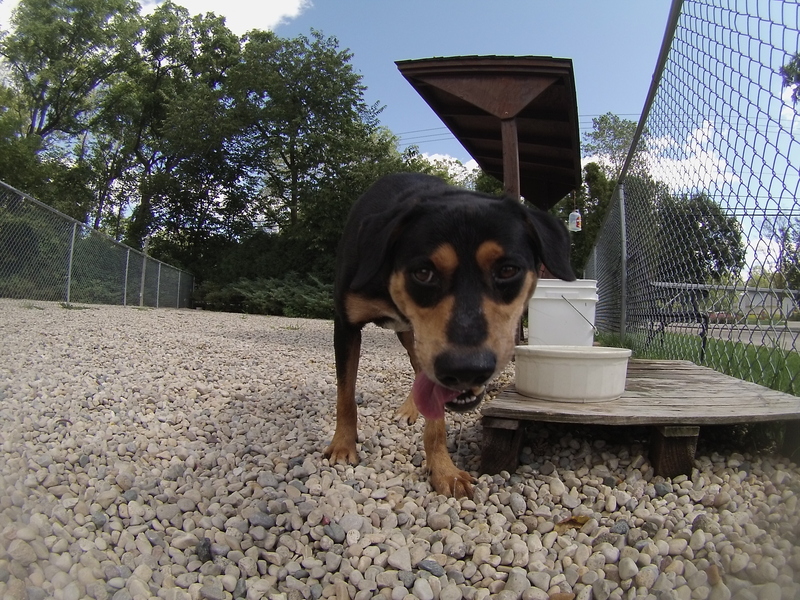 Duke the two-year-old Rottweiler mix has plenty of energy and a sense of adventure, so if you have an active lifestyle then Duke might be your dog! Duke pulled on the leash a bit when we first started our walk, but he settled down pretty quickly. 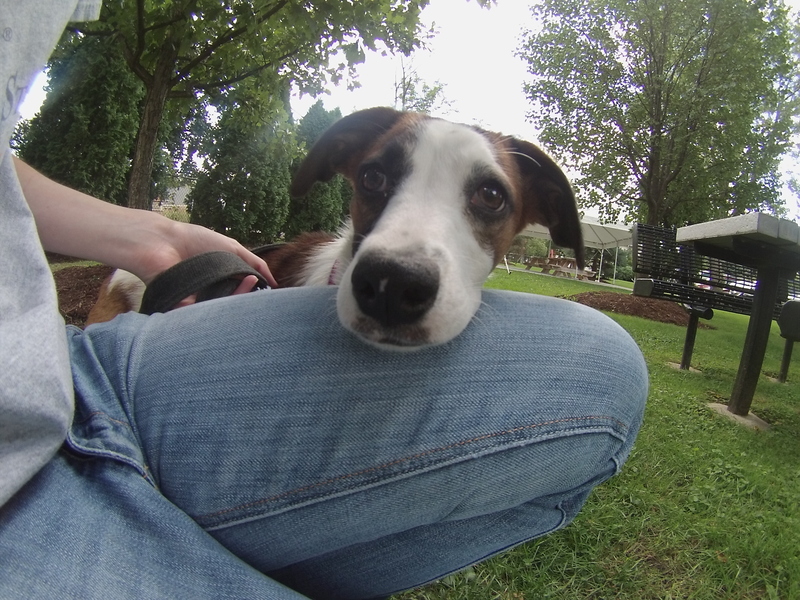 When I sat down on a bench, he stopped and sat right by my feet so I could pet him. Duke can be a bit of a rascal. When it was time for us to leave the off-leash run, he would scurry away whenever I came towards him with the leash. At first I thought it was because he might be a little shy or nervous, but then he started going into a play-bow before scurrying off and I realized he just wanted to play and romp some more. It wasn’t until I pretended to leave that he came over to the gate and let me put the leash on–which shows that he may like to play, but he likes being with his person even more! 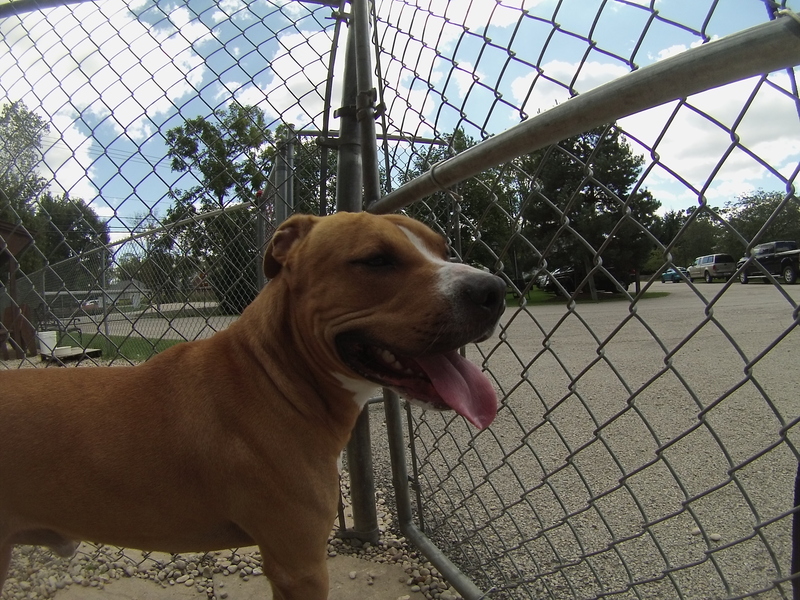 Stop by the shelter soon to meet Duke. Osito the two-year-old Miniature Poodle mix and Kanne the one-year-old Staffordshire Bull Terrier mix may seem like The Odd Couple, but they are best friends and they are looking to find their new forever home together. Osito and Kanne were abandoned by their previous owner, but they got through it together and are hopeful for the future! There are some people who believe that the “bully” breeds are dangerous and can’t be around other dogs, but Kanne is more than happy to prove them wrong and show how you can’t generalize an entire breed or group. Although Kanne can sometimes step on Osito when he’s excited (like when they learned it was their turn to go for a walk), it’s clear how bonded they are and how well they get along. Wherever Osito wandered inside the off-leash run, Kanne was never far behind. When Osito decided to climb into my lap, Kanne came over to give me a sniff of approval. Osito is technically the “big” brother because he’s older, and he knows that he can keep Kanne in line by giving a little yelp when Kanne gets boisterous. Osito was more interested in exploring and enjoying the outdoors at first, but soon enough he made his way over to me and was happy to cuddle. Kanne is very well-behaved, considering he’s just a year old–I was surprised to find out his age afterwards! After his initial burst of excitement when he first got out of the kennel, he was calm in the off-leash run. He enjoyed a good scratch under the chin and has surprisingly soft fur. If you’re one of those people who has a hard time choosing between small dogs and large dogs–here’s a perfect solution where you don’t have to choose! Osito and Kanne are already set as a pair. Now they just need a loving family and a place to call home. I also saw Bear, Blush, Cooper, Diamond, Gypsy, Lexi, Nana, O’Shea, Parzivie, Red, Scotty, Trixie, Tucker, Willow, and Zoey. So many greats dogs are waiting to meet you at Orphans of the Storm®! Posted by Meet the Pooches on September 17, 2015 in Dog Profiles and tagged adopt, adoption, animal shelter, animals, Chicago, Deerfield, dogs, Golden Retriever, Hound, Miniature Poodle, Orphans of the Storm, pets, Riverwoods, Rottweiler, Staffordshire Bull Terrier.